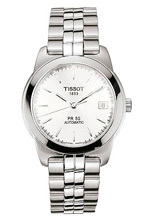 Description : Swiss Made Automatic ETA movement 42 hours power reserve with Hours, Minutes, Seconds and Date displays. Water-resistant to 50m/165ft. Scratch-resistant sapphire crystal. Stainless steel case.